For those who love land cruising, the wide road network of Himachal passes through some of the most exotic landscapes of the country. Exploring the countryside by Car and the more difficult trans-himalayan tracts in powerful 4×4 SUVs or in Group Motorbike safaris are a rage. Roads being the only reliable means for travel in the state, Himachal has invested much in connecting some of the remotest regions in the entire Himalayas. Driving past deep gorges like the Tranada Cliffs in Kinnaur or driving road to Pangi road has you admire the determination and endurance of the workers and engineers who cut past vertical rock formations to lay the road. For the adventure motorist, driving on some of the world’s highest roads, going over Rohtang (3980 m) or Kunzum Pass (4551 m) turns into a challenge. 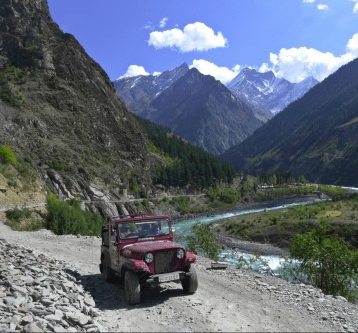 The drive from Chandigarh – Shimla – Kinnaur – Kaza – Keylong to Leh or through the alternate route of Chandigarh – Mandi – Kullu – Manali – Keylong to Leh is a lifetime experience. When driving through high altitude zones of Spiti, Lahaul, Chamba or Kinnaur, the choice of vehicle, and the season chosen are of uttermost importance. Cars may not be able to handle the rougher tracks but in no way does this curtail the range of possible experiences. You can always hire SUVs that are powerful enough to negotiate all roads, be they are smooth or rough. Motorcycle drives through Himachal are becoming increasingly popular with domestic and international tourists making their way to Chamba over Sach Pass, into Lahaul over Rohtang Pass or to the cold desert of Spiti through Kinnaur. Those comfortable with riding two-wheelers have an edge in negotiating difficult terrain and narrow paths. Often, these are coupled with camping, trekking and a spot of dirt-riding. Himachal is also the venue for several short and lengthier rallies and motor-sport competitions, the most famous being the grueling ‘Raid de Himalaya’.